UVB Radiation is a kind of ultraviolet light from the sun that has several harmful effects, UVB is particularly effective at damaging DNA, It is the cause of melanoma and other types of skin cancer, It has been linked to damage to some materials, crops, and marine organisms, The ozone layer protects the Earth against most UVB coming from the sun, You should protect yourself against UVB by wearing hats, sunglasses, and sunscreen. Small amounts of UV radiation are useful for the people & important in the production of vitamin D, UV radiation is used to treat many diseases, including rickets, psoriasis, eczema and jaundice, Darker skin has more protective melanin pigment, and the incidence of skin cancer is lower in dark-skinned people, Nevertheless skin cancers occur with this group and they are detected at a later, more dangerous stage. Ultraviolet (UV) radiation is divided into three categories of increasing energy which are UV-A, UV-B & UV-C, UV-A is a low energy form of UV & it has only minimal biological effects, UV-B is a higher energy form, it causes the most damage to living organisms and materials, UV-C is absorbed by oxygen in the atmosphere and never reaches us. The ozone layer acts as a natural filter, it absorbs most of the sun’s burning ultraviolet (UV) rays, Stratospheric ozone depletion leads to an increase in UV-B that reach the earth’s surface, UV-B can cause biological effects that is well demonstrated by the familiar sunburn that follows overexposure to the sun, The health impacts of excessive exposure to UV-B go beyond just getting burned, Exposure to UV radiation has been linked to many human health problems, including skin cancer. 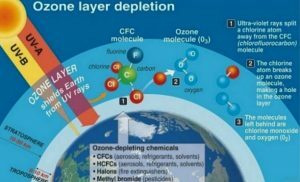 Ozone depletion describes two related events which are a steady lowering of about 4% in the total amount of ozone in Earth’s atmosphere (the ozone layer), and a larger springtime decrease in the stratospheric ozone around Earth’s polar regions, The latter phenomenon is referred to as the ozone hole. The main reason for ozone depletion & ozone hole is manufactured chemicals such as manufactured halocarbon refrigerants, solvents, propellants and foam-blowing agents (chlorofluorocarbons (CFCs), HCFCs, halons), referred to as ozone-depleting substances (ODS), These compounds are transported into the stratosphere by the winds after being emitted from the surface, and they release halogen atoms through photodissociation, that catalyze the breakdown of ozone (O3) into oxygen (O2). The ozone depletion and the ozone hole have increased cancer risks and other negative effects, The ozone layer prevents most harmful UVB wavelengths of ultraviolet light (UV light) from passing through the Earth’s atmosphere, These wavelengths cause skin cancer, sunburn & cataracts, which were projected to increase as a result of thinning ozone, as well as harming the plants and animals, These concerns led to bans of the production of CFCs, halons and other ozone-depleting chemicals in the Montreal Protocol in 1987. Ozone layer can be destroyed by a number of free radical catalysts, the most important are the hydroxyl radical (OH·), nitric oxide radical (NO·), chlorine radical (Cl·) and bromine radical (Br·), All of these have both natural & man-made sources, These elements are found in stable organic compounds, especially chlorofluorocarbons, which can travel to the stratosphere without being destroyed in the troposphere due to their low reactivity. The Cl & Br atoms are released from the parent compounds by the action of ultraviolet light, Ozone gas is a highly reactive molecule that easily reduces to the more stable oxygen form with the assistance of a catalyst, Cl and Br atoms destroy ozone molecules through a variety of catalytic cycles. The health risks associated with ozone depletion will be due to increased ultraviolet B radiation (UV-B) in the environment, increased damage to the eyes, the immune system and the skin, UVB radiation causes non-melanoma skin cancer and it plays a major role in malignant melanoma development, UVB radiation affects the physiological and developmental processes of plants & plant growth. Increased exposure to UV-B rays causes premature aging of the skin, UV-B causes cancer in domestic animals similar to those observed in humans, Although most animals have greater protection from UV-B because of their heavy coats and skin pigmentation. Increasing in UVB radiation could affect terrestrial and aquatic biogeochemical cycles, So altering both sources and sinks of greenhouse and chemically important trace gases, Synthetic polymers, naturally occurring biopolymers. Enhanced UV radiation promote increased incidences of eye disease & blindness, Eyes are very susceptible to damage from solar radiation and the risk exists for people of all skin colours, Unless eyes are protected, exposure to UV radiation can lead to conditions such as snow-blindness or even cataracts, UV-B radiation damages many parts of the eye, including the lens, the cornea, and the membrane covering the eye. Higher levels of UV radiation can have a damaging effect on your immune system, So, ozone depletion could reduce our resistance to certain cancers and diseases and give us reduced protection from vaccinations, It could create an increase in autoimmune problems and allergies, UV affects our ability to fight diseases, some viruses can be activated by increased exposure to UV. Ozone depletion affects on the human health and the ecosystems due to increased UV exposure, Our body’s defense network against illness includes our cellular immune system, This attacks cancerous or parasitic cells and research has shown that an element of this protection is the T-lymphocyte, which can be affected by solar radiation. When the sunlight passes through the atmosphere, all UV-C and 90% of UV-B radiation are absorbed by O2, ozone layer, as well as water vapor, oxygen & carbon dioxide, UV-A radiation is less affected by the atmosphere, So, the UV radiation reaching the Earth’s surface is composed of UVA with a small UVB component. Ultraviolet radiation not only affects humans, but wildlife as well, Excessive UV-B inhibits the growth processes of all green plants, ozone depletion may lead to a loss of plant species and reduce global food supply, Plants form the basis of the food web, Plants prevent soil erosion and water loss, and they are the primary producers of oxygen and a primary sink for carbon dioxide. You should keep sun exposure to a minimum, especially between the hours of 10:00 a.m. and 3:00 p.m. when the sun’s rays are the most intense, You can wear sunscreen, wide-brimmed hats, UV-B blocking sunglasses, and long-sleeved shirts and pants. Although the ozone layer is the one constant defense against UV penetration, several other factors can have an effect such as latitude, time of day, season, air pollution, rain and clouds, Rainy conditions reduce the amount of UV transmission, The greatest amount of UV reaches the Earth around midday when the sun is at its highest point, The air is thinner and cleaner on a mountaintop – more UV reaches there than at lower elevations. The sun’s rays impact the Earth’s surface at the most direct angle over the equator, they are the most intense at this latitude, During winter months, the sun’s rays strike at a more oblique angle than they do in the summer, So all solar radiation travels a longer path through the atmosphere to reach the Earth, and is therefore less intense. Clouds can have a marked impact on the amount of UV radiation that reaches the Earth’s surface, thick clouds block more UV than thin cloud cover, Clouds shield the Earth’s surface from UV radiation, urban smog can reduce the amount of UV radiation reaching the Earth, Incoming UV radiation is reflected from most surfaces, Reflected UV can damage the people, plants, and animals just as direct UV does.